It has not been a great Falcons season by any means as they came into the game against the Carolina Panthers with a 6-9 record. But if they were to beat the Panthers at the Georgia Dome on Sunday, the Falcons would win the NFC South for the third time in five years. That didn’t come close to happening as the Panthers hammered the Falcons 34-3 and win the division for the second consecutive season. Smith was right as the Panthers sacked Matt Ryan six times and the Falcons defensive line only sacked Cam Newton once. The Falcons only totaled 288 yards of offense and turned the ball over three times. The first half was not the half the Falcons players, coaches or fans envisioned. It started on the opening series when the Panthers drove 77-yards on 12 plays and that led to a Graham Gano 21-yard field goal. After forcing the Falcons to punt on ensuing series, Carolina produced a 10-play 87-yard drive which ended with a Cam Newton 5-yard touchdown pass to Ed Dickson. The Falcons did cut the lead to seven at the beginning of the second quarter when Matt Bryant kicked 21-yard field goal. 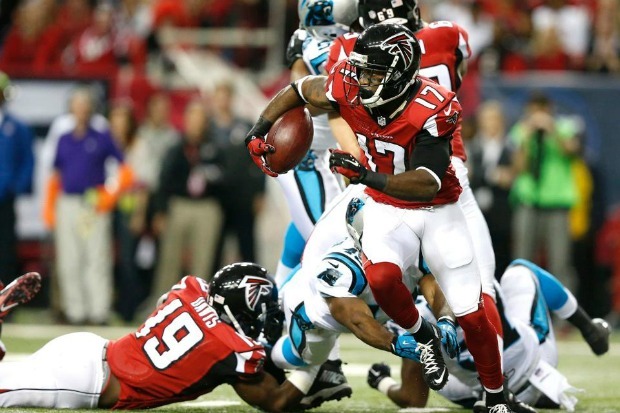 But the Falcons made two costly mistakes later in the quarter that led to 14 points for Carolina. The first mistake came when Ryan threw an interception to Roman Harper and he returned it for a 31-yard score. That was the third pick-six at home for Ryan this season. The second mistake came with less than two minutes left in the quarter when Ryan completed a 20-yard pass to Roddy White, but he fumbled as he was going to the ground and it was recovered by Thomas Davis. That led to a 4-yard touchdown run by Newton to give the Panthers the 27-3 lead going into the half. The second half was about the same for both teams. Carolina started the third quarter with a Gano 48-yard field goal. This happened after the Falcons went three-and-out on the opening series. The Panthers ended the quarter even stronger when Tre Boston intercepted a Matt Ryan pass are returned it for an 84-yard touchdown. That was more than enough for the Panthers to take home the NFC South crown and it was a very disappointing way for the Falcons to end their 2014 season after getting a big road win against the Saints. And Smith was very surprised on how the way his team performed. As for the future of Smith and the coaching staff, there will be more information about it in the next few days. But Smith wanted to only talk about the present. “I’m here as the head football coach until Arthur Blank tells me anything different,” Smith stated. White said he really admired what Smith has done for him and the Falcons the last seven years. But he’s not sure about the future of the organization. Ryan, who finished his night going 29-of-47 with 260 yards and two interceptions, echoed what White had to say in terms of the unpredictability of the NFL. “You never know in the NFL,” Ryan said talking about the team being 10-22 after going 13-3 in 2012. “It’s incredibly competitive week-to-week. Days like today don’t happen that often. Desmond Trufant also doesn’t know what’s going to happen, but he wants the coaching staff to stay. The Falcons finished the season 6-10 and third place in the NFC South. They were 3-5 on the road and 3-5 at home. They finished with a 6-6 record in the NFC and 5-1 record in the NFC South. It’s not the best selling points to keep Smith in Atlanta, but he has won more games than any other coach in Falcons history and has always kept his team in the hunt for a playoff sport except for one season. The Falcons will clean out their lockers on Monday and the final press conference of the season will be held Monday afternoon. As for Smith’s future, that could, and probably will be determined by Monday as well.